All Pets Animal Hospital was opened in 2001 by Dr. Brian Loudis. After many years of searching for the perfect site to build a high-quality animal hospital in a community that appreciated good medicine witha “family” atmosphere, his dream came true when he landed in Encinitas. The wide variety of pets and concerned owners of North County made it the perfect location for his hospital. In 2011, Dr. Aaron Lamoree joined the practice, and in 2013, Dr. Lamoree became part owner of the hospital. He brought with him a similar desire to practice quality medicine which keeps the patient at the forefront, while providing education and compassion to the pet owner. The practice grew steadily over the following years and eventually outgrew the original clinic. 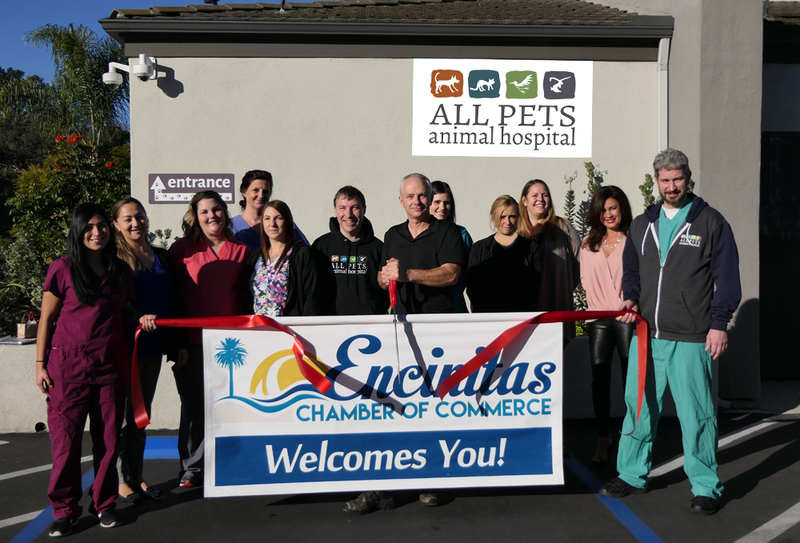 In January 2017, All Pets opened its new state of the art veterinary hospital at the corner of Encinitas Blvd andEl Camino Real where they practice with their outstanding associate veterinarians Dr. Neal Forman and Dr. Theresa Murillo. Today, All Pets Animal Hospital continues to provide compassionate, high quality, advanced veterinary care for dogs and cats as well as “exotic” pets such as birds, reptiles, rats, rabbits, ferrets, guinea pigs, hamsters, tortoises, lizards and snakes. They recognize the strong bond between people and their pets. After all, they have beloved animal family members of their own. They continually seek out new treatment options to provide their patients with the finest possible care at a reasonable price. They believe the best medicine is preventative medicine and want to educate you with the information that you need to protect your pet’s health for their entire life. All Pets is open 7 days a week and provides services such as examinations, vaccines, emergency care, surgery, dentistry, and medical boarding. All Pets Animal Hospital not only prides itself on taking care of their clients and patients but also being a positive active member in our community. All Pets works closely with animal care groups such as Parrot Education Adoption Center, the Morris Foundation’s Golden Retriever Lifetime Study, and the Foundation For Animal Care and Education. They have also raised money for Shelter to Soldier and the San Diego Food Bank. They would love to take care of all your companion animals!